Bring the family pet AND the kids! Island Beach Club F320 is waiting for you! 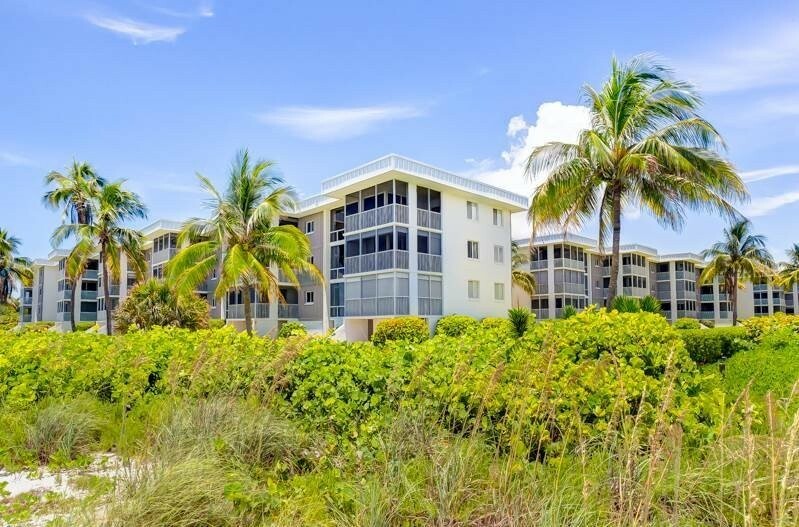 Island Beach Club 320F is newly renovated and is being offered for rent for the first time! 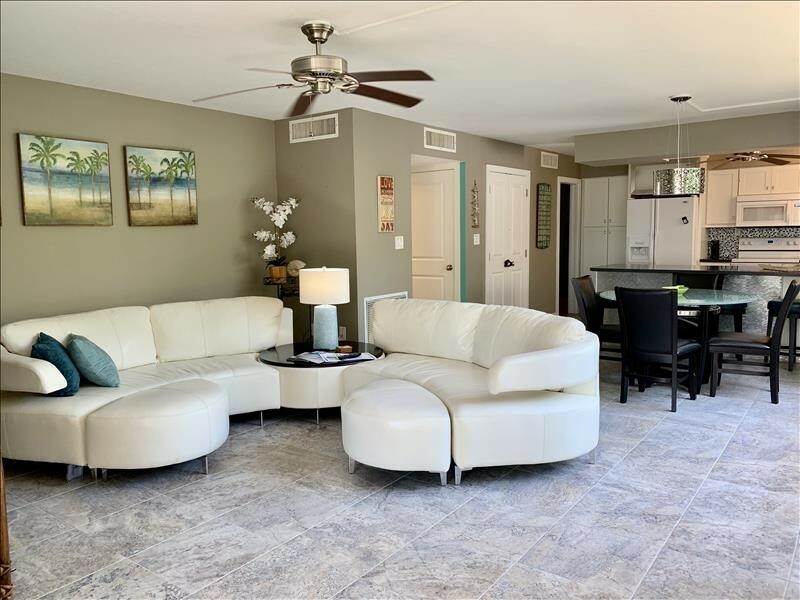 With 1300 square feet, this 2nd floor 2 bedroom, 2 bath condo is part of a 75-unit gulf front community that offers a terrific location, outdoor heated pool, bbq grills, shuffleboard; and, of course - access to the sugar sand Gulf of Mexico shelling beach is just steps away from your condo. Island Beach Club 320F offers a split floor plan, with the Master and Guest bedroom being closest to the entry and nearest to the pool. The living room, dining and kitchen area, lanai and laundry are situated on the east side of the buidling, which features lovely garden views. 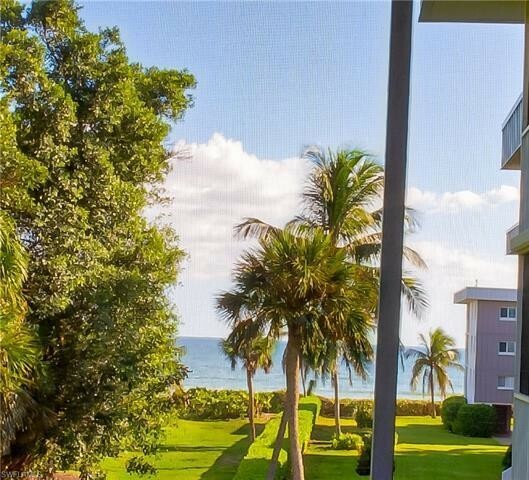 It is from the living room and lanai that you'll enjoy a lovely partial view of the Gulf of Mexico and see the subdued colors of the sunrise over Sanibel. 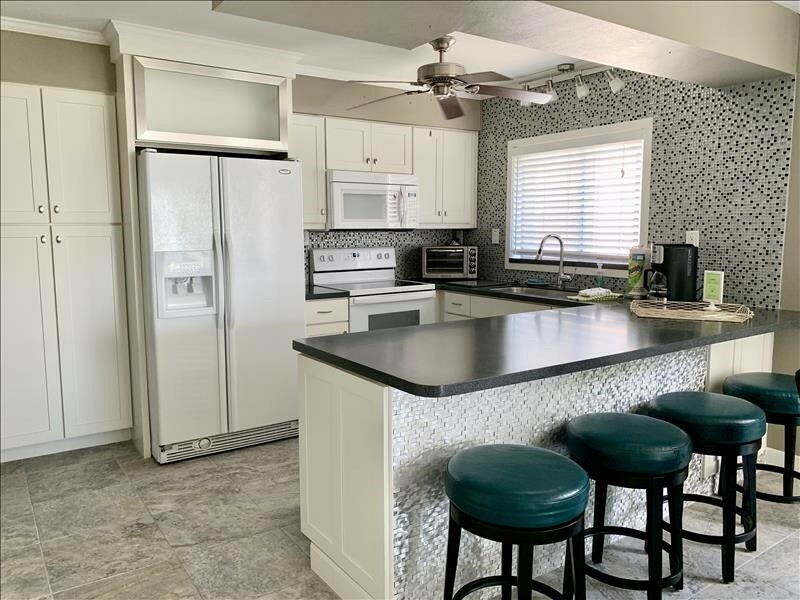 The living room has a sectional sofa, 55" tv and a gulf view, while the fully-equipped kitchen features a mosaic tile backsplash and coastal cream cabinetry, along with everything you need to entertain friends and family. The peninsula has seating for 4, and the dining table seats 4 comfortably. 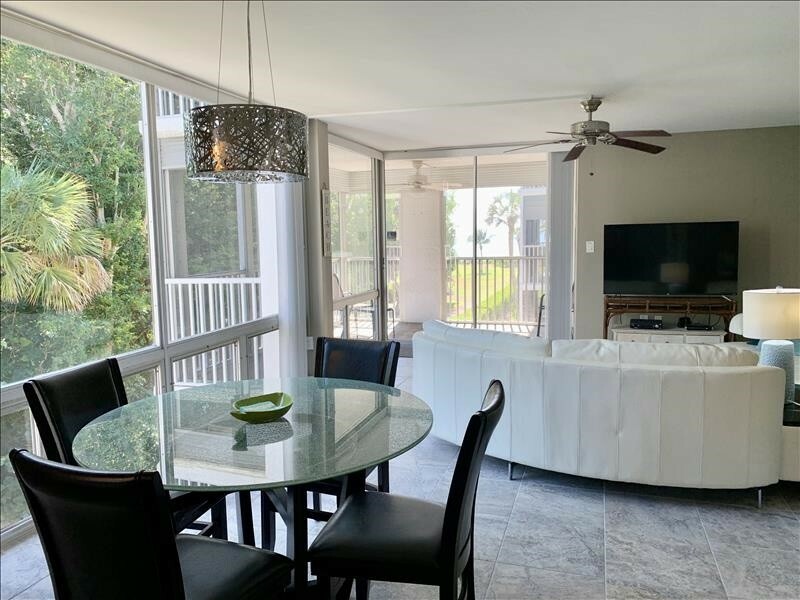 The wrap around balcony has fully retractible sliding doors, and the floor to ceiling windows offer a lovely east and southerly exposure and just enough of a view of the Gulf of Mexico to remind you that you're on island time. 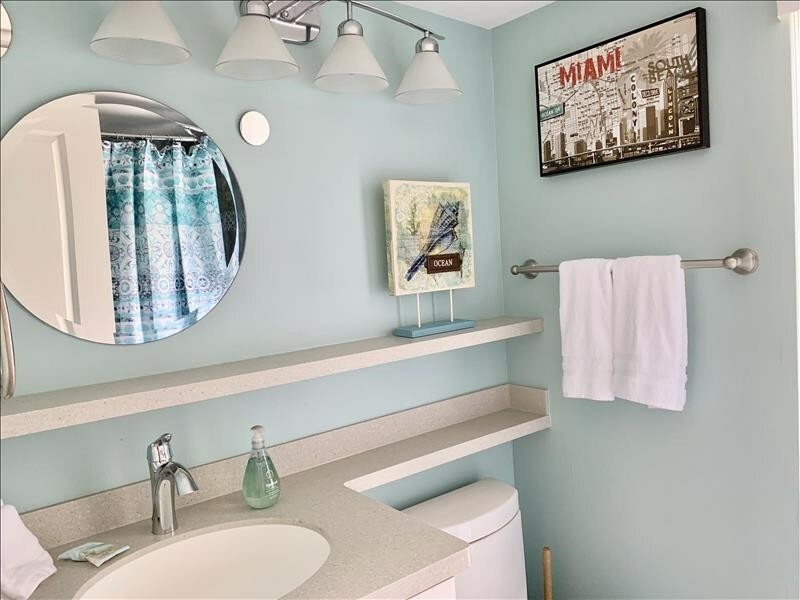 The spacious master bedroom has a King bed, a flat panel tv, en-suite bath with tub/shower and a walk-in closet. It also has access to the screened lanai. The guest bedroom features 2 twin beds with trundles under each (new photo coming soon - currently shown as bunk beds w/trundle). You can sleep 2 - 4 guests comfortably. There is an en-suite 3-piece bathroom with a shower, which offers privacy to your guests. 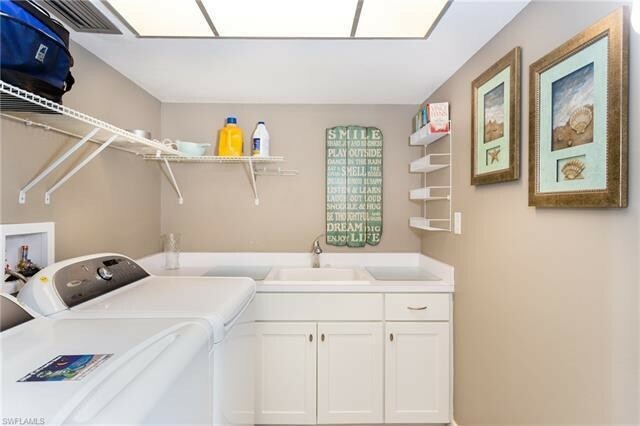 The walk-in laundry room features an extra large capacity high efficiency washer and dryer, as well as extra storage. Laundry detergent is provided for you. 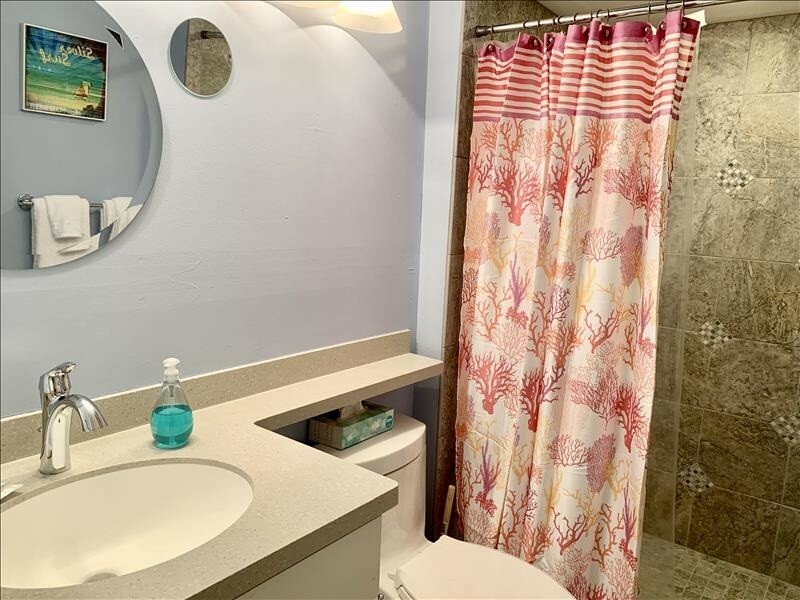 In addition to linens, beach chairs and beach towels are provided, and there is a private storage unit downstairs in the covered carport where the beach chairs can be stored. 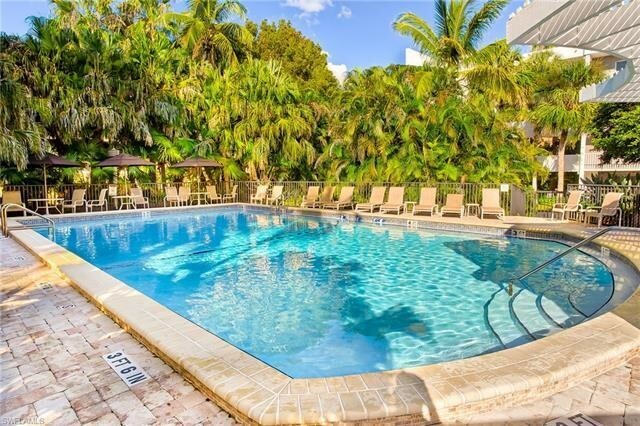 A quick walk down the stairs or a short elevator ride takes you to the pool area. 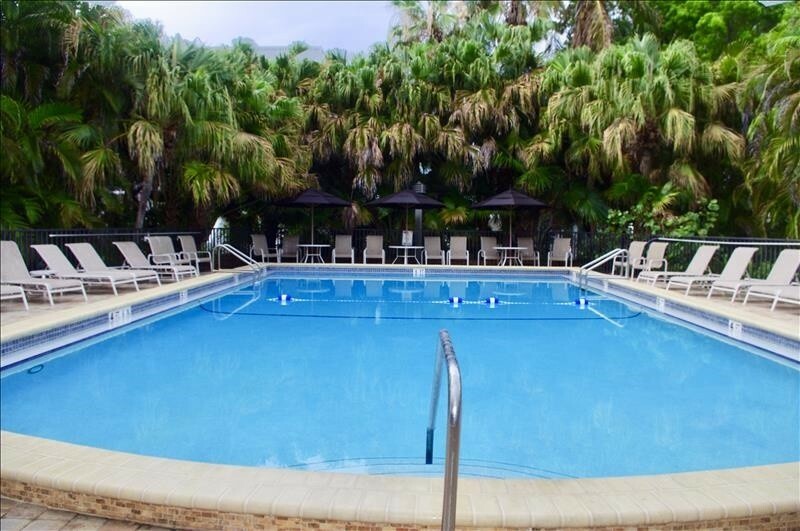 The outdoor heated pool offers a daily adult swimming hour, and there are chaise lounges and umbrellas to provide shade from the Sanibel sun. 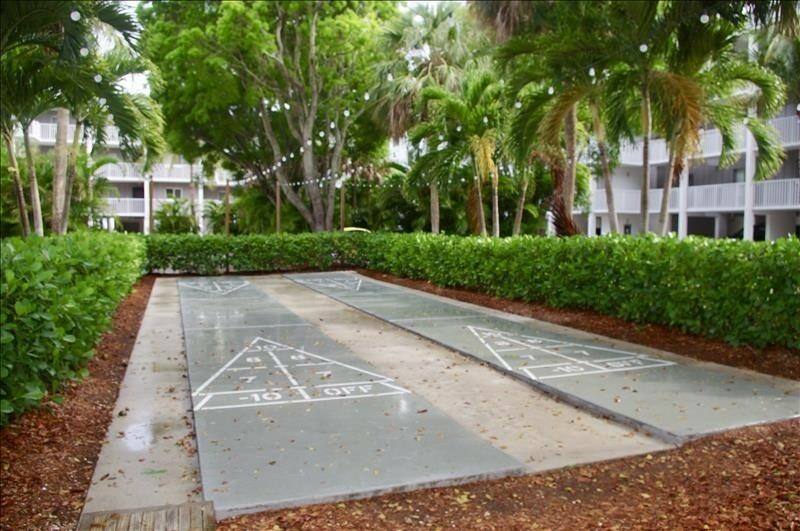 Join in on a game of shuffleboard, meet friends at the grills, or head on out to the beach and fish for your dinner. Island Beach Club's location can't be beat. 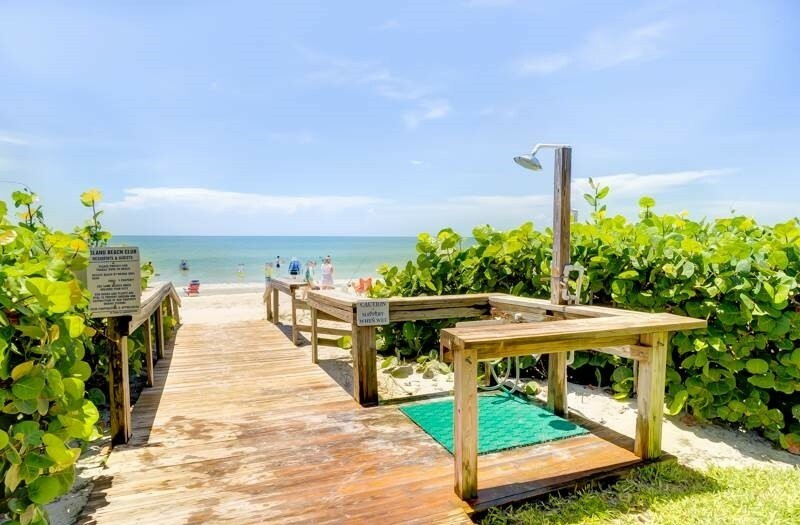 Enjoy sunrises and sunsets on the the beautiful sandy shelling beaches, or walk or bike Sanibel's 26 miles of Shared Use Paths to the birdwatch at the various parks and the nationally acclaimed J.N. "Ding" Darling National Wildlife Refuge. 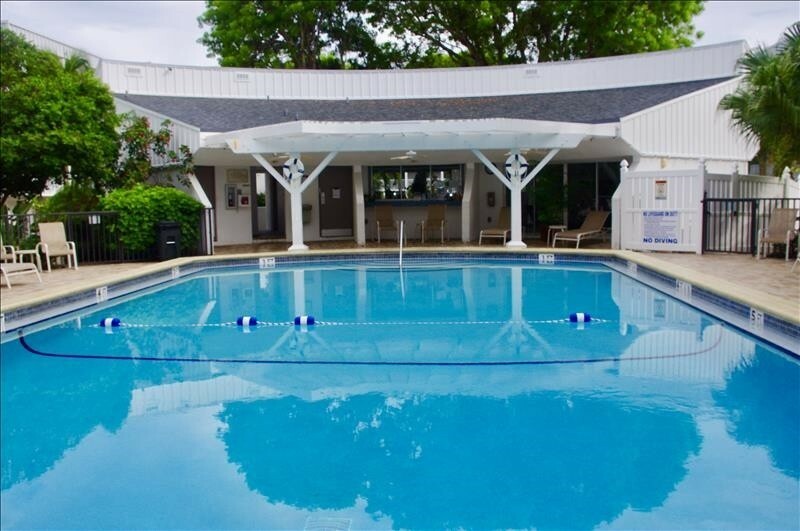 You are just shy of 1 mile from the historic Bailey's Grocery and the heart of the island restaurants, cinema, post office and shops; and, if you fancy a romantic dinner and don't want to cook, you can walk next door to The Historic Thistle Lodge restaurant, or grab a quick lunch at their pool bar. 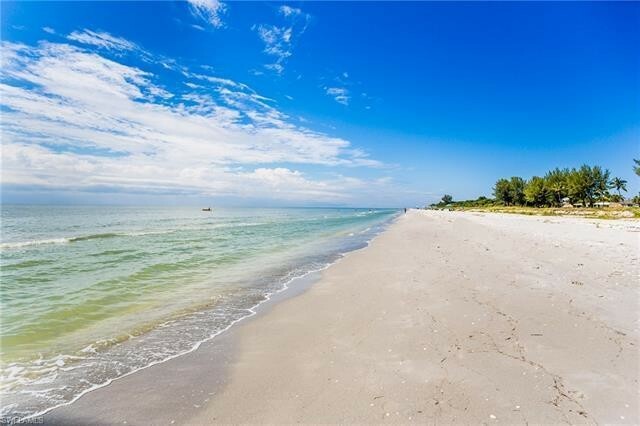 Island Beach Club F320 is professionally managed by Cottages to Castles of Sanibel & Captiva. Since 1997, they've been making sure that each stay is a memorable one. One small doggie under 25 pounds *may* be considered for this property, with prior approval of the Owner, Condo Association and Cottages to Castles. Payment of a non-refundable pet fee is required. The non-refundable fee is based on the length of your stay. Weight limit and breed restrictions are applicable. Please contact me with information regarding Island Beach Club F320. 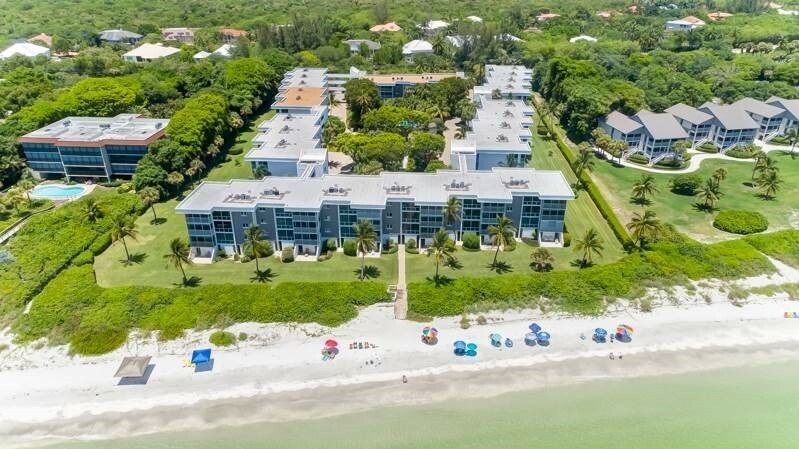 My family has been coming to Sanibel for over 40 years and have always rotated between the same two gulf side properties. We took a chance and stayed in unit 320F at Island Beach Club and were pleasantly surprised by how much we liked it! Typically we stay gulf front, but this unit was 2nd from the back. The view wasn’t nearly as good as gulf front, but we were pleased by how connected you still felt to the beach while in the unit. 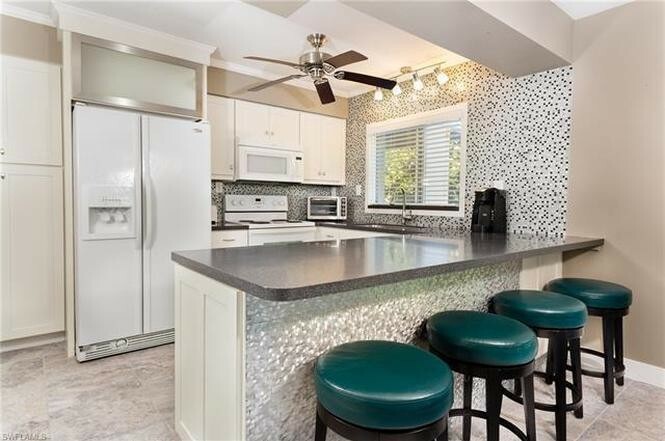 This particular condo had just been recently renovated and purchased 3 weeks prior to our stay. There were a few things lacking at first, but as soon as I made management aware, they were rectified. 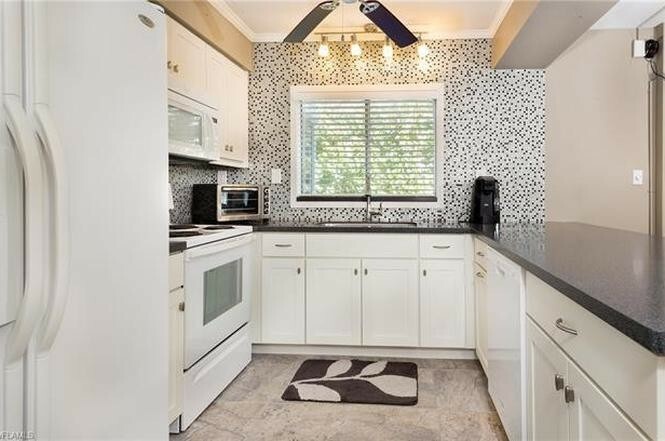 We highly recommend this condo and will be back again!